Raymond Sasia established the Police Nationale Training program to teach the techniques with the revolver he had brought back from the FBI. Notice that the S&W Model 19 with 3-inch barrel and fixed sights is pictured on the academy plaque. For greater durability, the Police Nationale went to Manurhin for the adjustable-sight MR73 (at left) and the fixed-sight MR73 (at right), both with 3-inch barrels. I first encountered the Manurhin MR73 revolver in Europe during the 1970s. I found it intriguing that elite European counterterror units had adopted a revolver when U.S. law enforcement agencies were switching to the self-loading pistol. Don’t get me wrong, I like revolvers. At that time, however, I was still using the Browning High-Power and would switch before long to the SIG P-226. I had fallen prey to the high-cap magazine spell. In my defense, though, I had been working on protective teams where having the firepower to cover an evacuation under fire was necessary. But, I found those French revolvers intriguing. Unlike American law enforcement officers, who had traditionally used revolvers, the French police had traditionally used autoloaders. Admittedly, a lot of those pistols were in .32 ACP, though the Gendarmerie Nationale used 9mm MAC50s. During the 1960s, France faced an increase in armed robberies, especially of banks, by the OAS (Organisation armee secrete), a group that also had attempted to assassinate President Charles De Gaulle on multiple occasions. It became apparent that the French Police had to improve their weapons and tactics. For standard Police Nationale and some other units, the 3-inch or 4-inch MR73 with fixed sights became the issue weapon. Raymond Sasia, who would become De Gaulle’s chief bodyguard, underwent training at the U.S. FBI Academy in the early 1960s and returned having absorbed FBI shooting techniques with the revolver. Sasia would establish a training academy to teach his version of FBI firearms usage: the Centre de Tir de Paris de la Police Nationale. He also determined what he considered the characteristics of the perfect police revolver, and the Police Nationale placed a special order with Smith & Wesson for Model 19 .357 Magnum revolvers with round butts and fixed sights. For general issue, however, the Police Nationale preferred a domestically produced revolver specifically designed for its needs. As a result, in 1971, Manurhin was asked to develop a .357 magnum caliber revolver. By 1973, the revolver was in production of multiple versions of what would be designated the MR73, for the year of introduction. For general police issue, 2½-inch, 3-inch, and 4-inch fixed-sight versions were offered. The next year, a Sport model with 3-inch, 4-inch, 5¼-inch, and 8-inch adjustable sights was introduced. The French counterterrorist unit of the Gendarmerie Nationale—GIGN (Groupe d’intervention de la Gendarmerie nationale)—had been using S&W revolvers, but these had failed to hold up to the unit’s training regimen of firing 150 rounds of full-power Norma .357 loads daily. Note, by the way, these loads were specially sealed for use underwater, as GIGN was trained for underwater approaches to a target. However, during GIGN testing, the MR73 fired 170,000 rounds with the same ammo and was still going strong when the testing was discontinued. GIGN adopted what was termed the Gendarmerie Model of the MR73 in 3-inch, 5¼-inch, and 8-inch barrel lengths. Each operator was issued a 3-inch and a 5¼-inch revolver, the shorter barrel for VIP protection or other plainclothes assignments and the 5¼-inch for hostage rescue/barricade/assault scenarios. It’s been quite awhile, but I think one of the GIGN guys told me they carried the 3-inch revolvers off duty. The 8-inch revolvers were used for urban sniping, usually with a bipod mounted. Lack of magazine capacity in the revolvers was not considered a disadvantage. In fact, Christian Prouteau, the first commander of GIGN, felt it was an advantage, as operators learned to carefully place shots, rather than relying on putting a hail of fire down range. Standard-issue weapons for GIGN were the 3-inch MR73 Gendarmerie Model (at top) and the 5¼-inch Gendarmerie Model (at bottom). A good example of the effective marksmanship of GIGN operators occurred on 26 December 1994, when GIGN assaulted Air France Flight 8969, which had been hijacked to Marseille by GIA (Armed Islamic Group of Algeria) terrorists. Capt. Thierry Prungnaud, acting as point man during the assault, killed two terrorists and wounded a third using his MR73 5¼-inch revolver. Other members of the assault team also carried their MR73s, though many carried a back-up Glock or SIG. I highly recommend the French film L’assaut, which portrays the GIGN operation quite accurately, including use of the MR73. The 3-inch MR 73 Gendarmerie Model was carried by GIGN members when operating in civilian clothes or otherwise when concealment was preferred. Other elite French police units would adopt the MR73 Gendarmerie Model as well, including GSPR (Groupe de sécurité de la présidence de la République), the French equivalent of the U.S. Secret Service Presidential Protection Detail, and RAID (Recherche, Assistance, Intervention, Dissuasion), the tactical unit of the Police Nationale. Austria’s counterterrorist unit GEK Cobra, currently EKO Cobra, also used MR73 revolvers for many years until replacing them with Glock 17s. The first surplus MR73s to come into the United States were former GEK Cobra revolvers. I’ll discuss those further later. On bottom, the Gendarmerie Model with 3-inch barrel and adjustable sights; on top, the standard police model with fixed sights. Many conventional French police units used standard fixed-sight 3-inch or 4-inch MR73s. These versions were also exported to police agencies in former French colonies in Africa, with a small number of adjustable-sight Gendarmerie Models going to officers or elite police units. A couple of years ago, a substantial number of these revolvers from Africa were imported into the United States. They showed a lot of bluing and grip wear and some needed gunsmithing, but they were still MR73s at a bargain price. MR73 barrels were precision hammer forged to aid accuracy, even with the 3-inch revolver. To understand what makes the MR73 such a durable and accurate revolver, it is necessary to take a quick look at its metallurgy and engineering. The MR73’s frame is slightly larger than that of an S&W K-frame revolver, and much more durable. An MR73’s cylinder size (38mm) is larger than a K-frame (36mm), but smaller than an L-frame S&W’s cylinder size (39.5mm). The steel used in MR73 revolver frames, barrels, and cylinders is an extremely high-quality ordnance-certified alloy. To give an idea of the steel quality, a friend of mine who is a metallurgist became interested in the MR73 specifically because of the legendary durability of its steel and has purchased numerous examples to study. MR73 barrels are hammer forged and rifled with six grooves. Cylinders are milled from a forging; then chambers are roller burnished after drilling. Rear sight of the Gendarmerie Model MR73; note that the edges are rounded and that it is only 22mm wide to aid in drawing from the holster. Rear sights on Sport and Gendarmerie MR73s are click adjustable; on Sport Models, 24mm wide, and on Gendarmerie Models, 22mm wide with rounded edges, so as not to impede the draw. Use of rollers and adjustable main and trigger return springs allows trigger pull to be adjusted to the shooter’s preferences. For example, the GEK Cobra guns that came in some years ago had been adjusted for double-action shooting. Also useful for accuracy and speed of engagement is reduction in lock time, as the MR73 has a hammer-fall angle of only 42 degrees, compared to 54 degrees for typical S&W revolvers and 60 degrees for the Colt Python. Screws in the MR73’s front grip strap allow adjustment of the trigger to meet the shooter’s preferences. MR73 revolvers underwent a factory accuracy test requiring five shots into a 20mm (.8″) circle at 25 meters. I have seen reference to 15 rounds being fired, with no group acceptable over 20mm. Presumably, this means at least three groups were fired. MR73s received a lot of hand fitting, so any revolver that failed accuracy or reliability testing went back to the bench. The high degree of hand fitting and polishing (12 hours is usually mentioned) contributed to the MR73’s smooth trigger pull. View of the windage adjustment screw on the MR73’s sights; also visible are the Manurhin logo and the “Made in France” marking. A useful accessory for the MR73 revolver, especially for those living in Europe or other parts of the world where the 9x19mm round is the standard, is a fitted auxiliary 9mm cylinder that may be ordered with the revolver. In an area where inexpensive 9x19mm ammo is available and .38 Special or .357 Magnum is not, this cylinder is desirable. Three of the grip styles available for the MR73—from left to right: compact grips for small hands and/or the 3-inch barreled revolvers, larger grips with finger grooves, and Trausch grips. An array of grips helps tailor the MR73 to the shooter. Wood grips of different sizes, some with finger grooves, are available. Also, a popular option is Trausch rubber grips, which are bulky, but really excellent for double-action shooting. On his carry MR73, Thompson uses the Trausch grips and trigger shoe that make it easier to shoot well in DA mode. Ever since I first shot the MR73 in Europe, I had wanted one but did not want to deal with the various red tape to import one. Manurhin, not being pleased with U.S. product liability laws, had not actively pursued the U.S. market. However, quite a few years ago, the GEK Cobra 4-inch-barreled MR73 revolvers were imported into the United States; I quickly ordered two of them for what I considered an excellent price. They were gone within a few weeks and a year later were selling on GunBroker for three or four times what I had paid for mine. Thompson’s 3-inch MR73, along with the Rusty Sherrick holster in which he carries it. The guns showed holster wear and had been adjusted for DA use. Each one had Trausch grips and a trigger shoe. But, they were tight and accurate. I did have to do a little adjusting of the trigger so I could use the revolver in either single- or double-action mode. Actually, the double -action pull is so good, I normally use the one I shoot all the time in DA 80-90% of the time, unless firing at 50 yards or more. I was curious about my two guns, so I had a contact with GEK Cobra check on my two revolvers. Based on the serial numbers I had sent him, he estimated that my guns had around 200,000 rounds through each of them. He wasn’t positive, but based his estimate on the average rounds a GEK Cobra operator fired each year in training and how long the guns had been on issue. Note how the Rusty Sherrick holster shields the MR73’s rear sight so that it doesn’t snag during the draw or while being carried. One of those two is in my safe, but the other one I take shooting at least once a month. Since I’ve had it, I’ve put another 10,000-plus rounds through it, almost all .357 magnum loads. 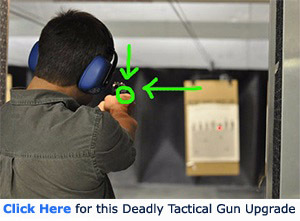 It’s the gun I used for the shooting tests in this article. Three-inch MR73 being carried in the Rusty Sherrick holster. When the latest batch of MR73s came in from Africa, almost all had fixed sights, but a few had adjustable sights and were in better condition, probably because they had been issued to officers or elite units. A friend who had bought some of them sold me a 3-inch gun with adjustable sights that is now my carry MR73, when I choose to carry a belt revolver. I am so used to using the Trausch grips and trigger shoe, that I installed them on my 3-inch revolver as well. As with the 4-inch gun, I shoot the 3-inch one mostly in DA mode. To offer a less expensive alternative to the MR73, Manurhin engaged in a joint venture with Ruger to produce the MR88. Getting leather for my 3-inch MR73 was a bit of a challenge, as the large rear sight requires a holster that keeps it from catching on a jacket lining but still allows quick presentation. Rusty Sherrick made me one that works perfectly. Just a quick comment on 3-inch barreled .357 Magnum revolvers: Prior to carrying the 3-inch MR73, I sometimes carried a 3-inch S&W Model 66. With a 2½-inch barrel, the ejector rod is not normally long enough to fully eject the longer .357 Mag empty cases, but with a 3-inch barrel, it usually is. This is also true with the MR73. Fast reloads with my carry 3-inch MR73, however, do not involve a speedloader. Safariland J-K2C speedloaders will work with an MR73, but not with Trausch grips installed. Instead, I carry spare rounds in an ammo wallet. Groups shot with various ammo when testing the MR73 for this article showed good consistency. I’ve managed to pick up a couple of other MR73 revolvers by watching gun auction sights and having a friend who imports them after buying them at auctions in Germany. One that I shoot especially well is one of the 5¼-inch versions that was the standard with GIGN. Mine even came with a fitted 9mm cylinder. 15-yard group with the 4-inch MR73 from the low ready position, fired fast DA. I should also mention the Manurhin MR88, a few of which have been imported over the years. The MR88 was designed to be a less expensive Manurhin option adopted by the Police Nationale. A joint venture between Manurhin and Ruger, the MR88 is a nice revolver. Most often found in the United States is the 3-inch fixed-sight version issued to French police and also exported to Africa. Also occasionally to be found is the Manurhin Special Police F1, which, though French-manufactured, is basically a Ruger Security Six-type frame with a Manurhin barrel. Once again, it’s a good revolver, but it is not an MR73. I combined doing some test shooting for this article with taking my 4-inch GEK Cobra MR73 to the range. Firing single-action at 25 yards, five-shot groups ran 2½” to 4″ using three types of ammo. I also did double-action shooting at silhouette targets at 15 and 25 yards. I was firing faster DA than SA but was still getting good groups in the center of mass. The Trausch grips make cocking the hammer for SA fire a little slow, as the support hand thumb needs to be employed. As I said, I shoot this revolver more DA than SA. It shoots straight both ways. Chapuis Armes in France still produces some versions of the MR73 and the MR88. I’ll give its website info later. A few importers do bring in the MR73 in small numbers. I won’t recommend any specifically, as I have not dealt with them. By watching the gun auctions, an MR73 can be found. The last batch of those imported from Africa is drying up, and their price is rising. I have a saved search for MR73s on auction sites and an occasional nice Gendarmerie or Sport model with adjustable sights turns up. If you want one, plan to spend $2,000 or more, though. What I keep hoping is that all of those MR73 revolvers, previously used by French police, that have been replaced by the SIG Sauer SP2022 will one day be imported into the United States. If they do, my advice is to buy one or two or three. I have, at times, risked being called unpatriotic by saying the MR73 is the best revolver in the world. It is of very high quality, but I’d qualify my respect for the MR73 by saying it is the best revolver for someone who plans to shoot it a great deal and carry it in a holster. For pocket carry, the S&W J-frame is a better revolver. For outdoor carry in places where dangerous game comes with two feet or four feet, an S&W Model 29 or 57 or a Ruger Redhawk is a better revolver. For an inexpensive car or truck gun, a police trade-in S&W Model 10 or 64 is a better revolver. The MR73 is a great revolver—accurate, reliable, and durable. But, you can’t just walk into your local gun shop and find one. Still, if you do find one, you have not only a very viable combat revolver, but one that rode on the hips of some of the most elite counterterrorist operators in the world. That’s nice cred! Enjoyed the article! Never even knew these were used by French PD and Spec Ops units. I still have my S&W Model 66 and love it to death. I carried a S&W 686 L frame for some time when I was a BP agent (went to the Berreta .40S&W and finally the HK P2000 in 40 S&W). We qualified at 50 yards with the revolvers but went to only 25 yards course of fire when we got the semis. I would have purchased my L frame from Uncle but they were destroyed per Federal Law. What a stupid thing. Still remember the serial # forever.